Pavan Verma of JDU has written a book on Adi Shankaracharya. His interview is very informative and is given below. Pavan Varma is a celebrated diplomat, cultural catalyst and public intellectual. 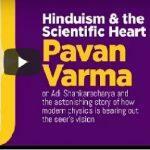 His new book on the Shankaracharya throws startling light about Hinduism and its fascinating relationship with science.